I recently wondered aloud to an actor friend if OzAsia might be my favourite Australian arts festival. Where once it could feel worthy but dull, more an exercise in cultural diplomacy than artistic vitality, under the reinvigorating artistic directorship of Joseph Mitchell it has consistently delivered works of thrilling formal and conceptual intrepidness. Mitchell’s fourth festival promised to reaffirm a globalised perspective on the reach and influence of contemporary Asian arts while also highlighting work of striking, if sometimes alienating, specificity, a reminder that language is more readily translated than culture. If a single theme emerged strongly across this year’s program it was displacement, the unsettling of body and being by the effects of colonisation, technology and environmental disruption. In Adelaide choreographer Alison Currie’s Close Company, a collaboration with Singapore’s RAW Moves and developed as part of OzAsia’s Asia-Australia exchange program Dance Lab, two dancers, Matthew Goh and Stephanie Yoong, undertake a ‘series of tests’ exploring the idea of co-dependency. Across three short but distinct parts they perform a restrained but dexterous choreography of connection and isolation, drawing together and pulling apart, mirroring each other from a distance or erotically embracing. Sometimes they simply observe or, for example when they check their phones, ignore each other. 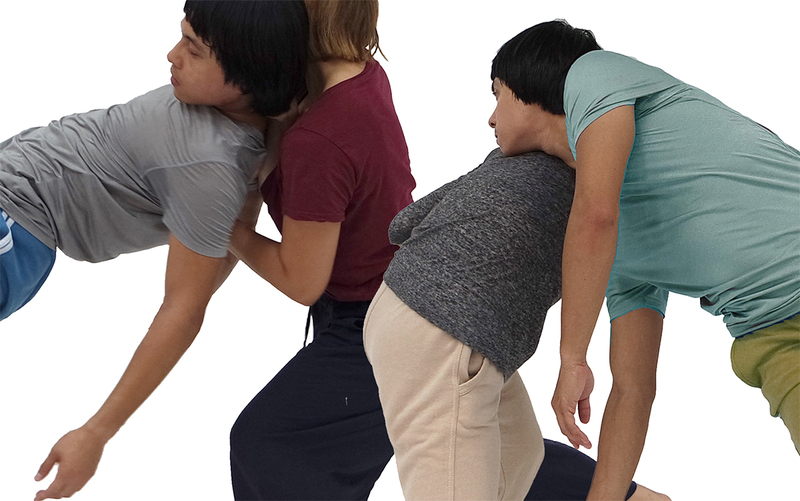 In the work’s final part the dancers thread their bodies into a single piece of clothing, something like an outsized T-shirt, and, in an arresting image of mutual dependence, take it in turns to carry each other around the space on their backs. As each test is taken, bookended by the chiming of an iPhone alarm, Goh and Yoong — both the experiment’s facilitators and its subjects — gradually fill in a wall chart, each assigning a number from one to 10 to a range of variables: connection, intensity, pace, pressure, softness. As its name suggests, the work is an intimate experience, the dancers performing in close proximity to audience members who are able to move freely around the space, and are at one point invited to illuminate Goh and Yoong with the flashlights on our phones. Close Company is a modest work but one that, through its balanced modulation and effective twinning of the analytical and sensual, rewards the close attention it quietly urges. In December 1955 in Baling, a small north Malaysian town near the border with Thailand, British officials hosted a series of secret talks between Malayan Chief Minister Tunku Abdul Rahman, his Singaporean counterpart David Marshall, and communist leader Chin Peng, formerly a hero in the war against the Japanese, then the ‘most wanted man’ in the British empire. The aim of the talks was to end the seven-year-long revolutionary war dubbed the ‘Malayan Emergency’ by the colonial government, but they ended in a deadlock, albeit one that prefigured Malaysia’s independence from British rule two years later. This fascinating if byzantine and largely forgotten episode in the mid-20th century’s wave of anticolonial and pro-communist insurgencies is, in Five Arts Centre’s Baling, transfigured into a measured documentary theatre performance based on publicly available transcripts of the talks, hundreds of printouts of which adorn one wall of the space from floor to ceiling. 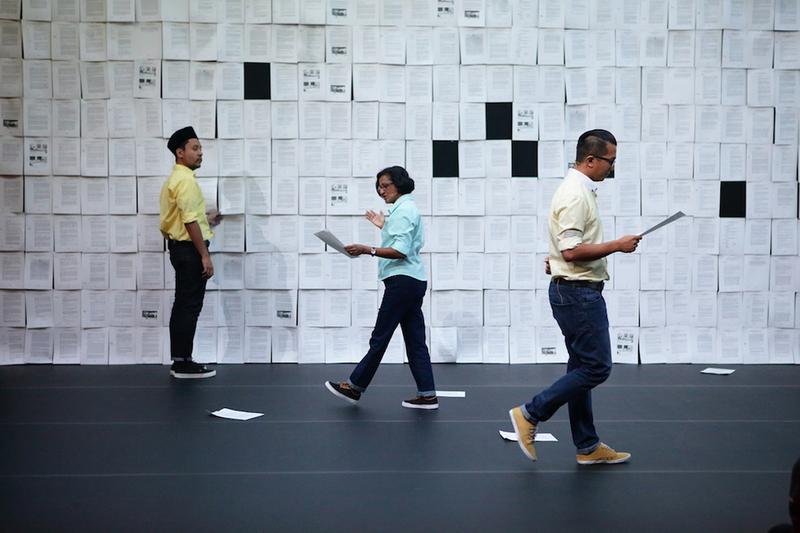 In a vivid illustration of the necessarily selective and incomplete nature of historical reconstruction, actor-researchers Anne James, Imri Nasution and Faiq Syazwan Kuhiri pluck individual pages down, reproducing the formal but impassioned tone of the talks, the participants in which they perform interchangeably. In this way, and in the periodic moving of the audience to different parts of the space, our perspective on the theatricalised events is constantly shifting. The work’s interest, even when its textual and historical density threaten to overwhelm, lies not so much in its form — although, under Mark Teh’s astute direction, it’s enlivened by the projection of photographs and newsreel footage, and the interposing of the actors’ personal connections to Baling and its repercussions — but rather in the studious way it reanimates the gravity of the events. At stake is the fate of a nation, poised between violently opposed ideologies, and to be decided by charismatic men. If Teh has an agenda it’s to rehumanise Peng, long made a bogeyman by the nationalists and still a contentious figure in present-day Malaysia (Kuhiri recounts an earlier performance of the Baling transcripts he was involved in that was monitored by Malaysian Special Branch, and afterward being attacked online as a communist sympathiser). The work’s quietly moving climax sees Nasution, also a documentary filmmaker, revisit footage of an interview he recorded with Peng, close to death and living in exile in Thailand. The clips were never used; in them, the old Malayan patriot seems far-gone, responding to Nasution’s questions with long, rambling answers or simply silence. One thing is clear: he aches to return home, a wish that was never granted but feels, however partially, redeemed by Baling’s sympathetic but never hagiographic portrait. Adelaide-based director Paulo Castro’s Hello My Name Is… also shines a light on a little-known but still reverberating regional trauma, Indonesia’s bloody occupation of Timor Leste and particularly the 1991 Santa Cruz massacre in which 250 East Timorese pro-independence demonstrators were gunned down in a Dili cemetery. Similarly to Baling, the work resonates with personal connections to the events it depicts: actor Jose Da Costa survived the massacre and was imprisoned in its wake while, more distantly, Castro is implicated in the violence via the role of his home country, the former colonial power Portugal. The work’s text, sitting somewhere between a polemic and a eulogy, is drawn from Edward Bond’s Choruses After the Assassinations, a brutally poetic treatise on the aftermath of war. 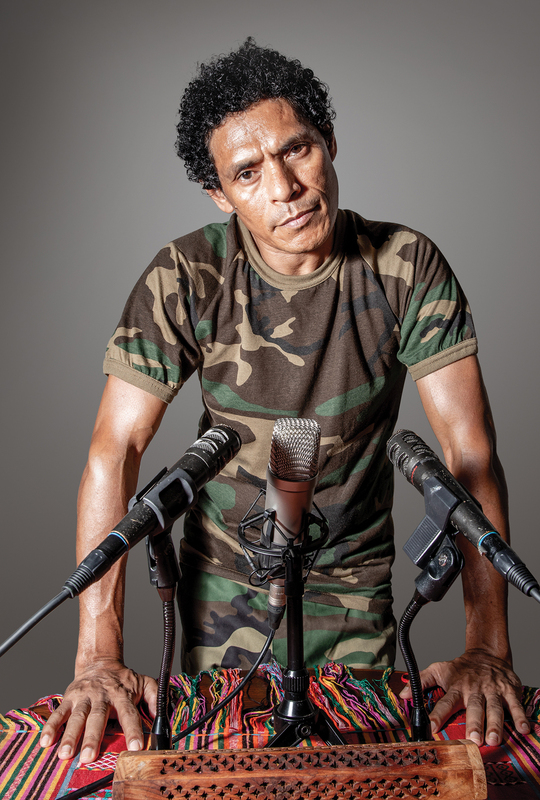 “Children lose their parents,” says Da Costa, his delivery both haunting and haunted, “parents lose each other.” In a commendably restrained solo performance, he also gives voice to the forces that kill and destroy: “I am the army. My feet are tanks, my arms are guns.” He brandishes a pistol and wields a wooden cross like a machinegun. But it is state rather than military actors that are painted most darkly here. Da Costa, dressed in army fatigues, sets up the stage like a meeting room for an international conference, assigning name plates to tables for the political figures involved in the events: Ali Alatas and Gareth Evans, the then foreign ministers of Indonesia and Australia respectively, and Xanana Gusmão, the Timorese resistance leader and later Prime Minister. Places are also reserved for ‘Independent Anonymous,’ represented by a human skull, and current UN secretary and former Portuguese Prime Minister António Guterres, an anomalous nod to Timor’s colonial past and, perhaps, a comment on the occupation’s ongoing significance. Da Costa scatters bones around the tables, and, with black irony, places an oil drum on Evans’ desk, and toasts the relationship between Australia and Indonesia with champagne. Finally, having wrapped himself in and then cast off both the Timor and Portugal national flags, he zips himself into a skeleton hoodie and lies down next to a makeshift shrine in solidarity with the dead. Castro’s direction is deftly imagistic (he also designs the show’s lighting and sound, the latter comprising a repeated fragment of post-rock) but, as in much of his self-devised work, Hello My Name Is… feels dramaturgically flat, individual moments strikingly composed but failing to cohere into stronger narrative or thematic purpose. Nevertheless, it’s a work, anchored in Da Costa’s fine performance, that potently expresses the moral bankruptcy at the heart of empire-building, and the violent oppression and exploitation that continues its legacy in all but name. Also a meditation on destruction and loss, War Sum Up by Danish company Hotel Pro Forma was, for many, the high watermark of this year’s OzAsia Festival. Reaffirming Joseph Mitchell’s interest in showcasing contemporary Asian opera — Japanese composer Keiichiro Shibuya’s ‘vocaloid’ opera The End appeared in last year’s program — it’s a work of considerable scale and interculturalism, requiem-like in its sustained atmosphere of grief and dread but thoroughly modern in its pop art-inflected hybridity. Musically, the opera is elegiac, its score — the fruit of a seemingly unlikely collaboration between Latvian composer Santa Ratniece, French sound artist Gilbert Nouno and UK electro ensemble The Irrepressibles — feels indebted to sonorism, the tonal style typified by Henryk Górecki, György Ligeti and others, and often used (as in the films of Stanley Kubrick) to convey a sense of the horrific or numinous. Performed via laptop, with the Latvian Radio Choir under the baton of Sigvards Klav, the score is rich, textural and varied, cluster chords on violin blending seamlessly with electronic elements, cartoon sound effects and the voices of the 11 singers, plus solo soprano Ieva Ezeriete, who wear microphones. Willie Flindt’s sparse, Japanese-language libretto (English surtitles are provided) makes use of Noh theatre archetypes, each emphasising the physical and spiritual desolation of war: the Soldier (Aigars Reinis), the Warrior (Gundars Dzilums), and the Spy (Ilze Berzina). Ezeriete, who sings with impressive strength and clarity, portrays the Gamemaster, a sort of power-suited politico who initiates the action by cranking out a sentimental melody on a music box; though the narrative is nonlinear and sharply modular, the harrowing stories of each character never meaningfully connect. The chorus — costumed by Henrik Vibskov in a kind of soft armour reminiscent of both Japanese warrior culture and the aesthetics of Steampunk — remains more or less static throughout, the four principals stepping out of tableaux-like groupings to sing their laments. 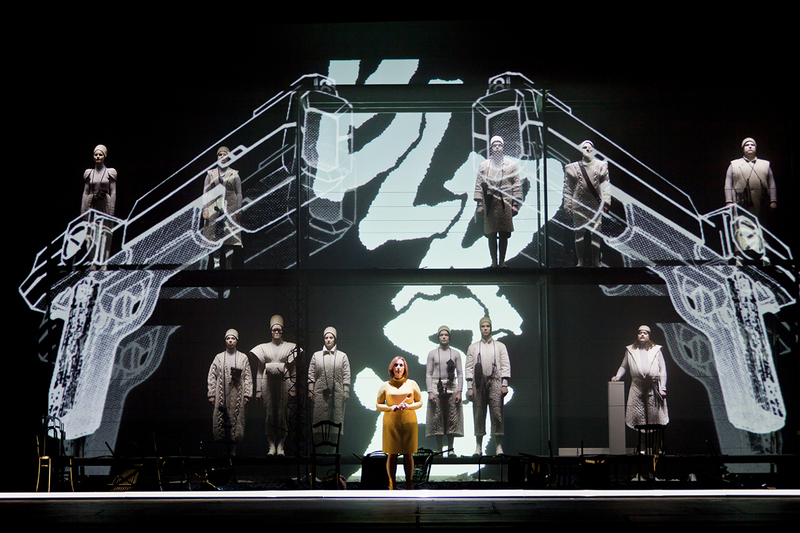 The work, staged on a two-tiered platform, is a visual cornucopia. Vast back-projections feature Hikaru Hayashi’s manga illustrations, diagrams of weapons and military vehicles, and, perhaps superfluously, gruesome black and white battlefield photographs. Projected text, slickly integrated with Jesper Kongshaug’s monochromatic lighting design, effectively undermines the libretto’s spare poetics with matter-of-fact litanies of PTSD treatments and spy lingo. Director Kirsten Dehlholm of Hotel Pro Forma assimilates it all superbly, and leaves us with a disquieting image of horror wrought from the everyday: the silhouette of a tank formed by a spotlight cast on a jumble of furniture. In such moments the work’s message doesn’t feel reducible to a simple ‘war is hell;’ it’s freighted instead with ambivalence, eliciting a kind of terrible wonder. In Andropolaroid 1.1, Berlin-based Japanese choreographer Yui Kawaguchi also explores the intersection of the human and nonhuman, the potential for both transcendence and brutalisation in their meeting. Dressed in white and moving among husband Fabian Bleisch’s installation-like array of vertical neon light tubes suspended in two slanting planes, Kawaguchi performs a sort of duet with herself, imbuing the space with a sense of two distinct presences, one implacable and machinelike, the other all too human. 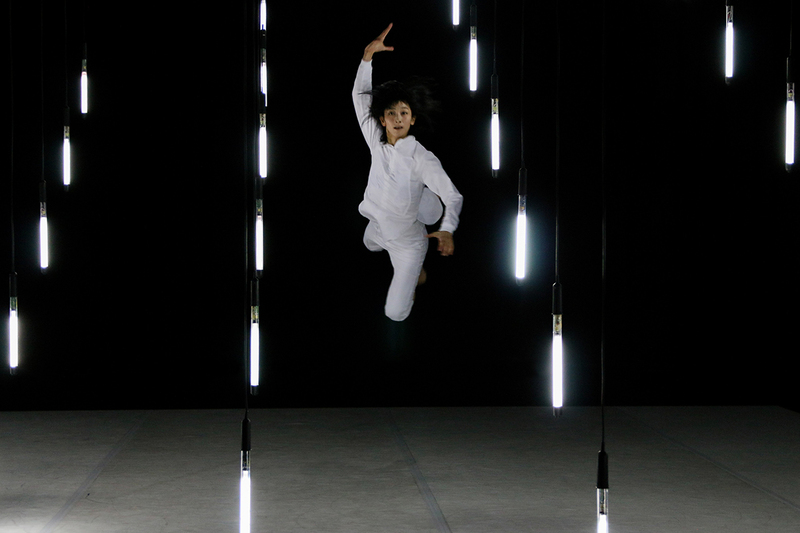 In the first part of the work Bleisch’s lights, synchronised with electronic pings, snap on and off singly and in clusters, creating shifting visual fields for Kawaguchi’s athletic, ballet- and hip-hop-inflected movements. Impeccably timed jumps under strobe lights leave her seemingly suspended in mid-air. A section set to announcements in Japanese and German, as in some uncanny transit lounge, hints at Kawaguchi’s growing estrangement from the world around her. In the work’s second part she seeks something — shelter, comfort, a sense of belonging? — in a red hoodie dropped from the ceiling, alternatingly embracing and discarding it as pulsating dance music erupts with every touch. Having donned the hoodie she becomes manic, the formerly restrained choreography opening out into a new expansiveness as she wheels about the space (somehow mostly avoiding the overhanging lights) before finally becoming exhausted, or perhaps short-circuited, by it. Kawaguchi’s suddenly expressive face suggests a newfound oneness of the body — albeit, perhaps, still a post-human one — from which she had seemed perilously dissociated. It’s a quietly hopeful image.